See here for my previous note on flavors and molecules in beer. A recent post about tasting notes from Brother Barley has really got me thinking. I’ve always felt humbled by the descriptive terms the other Aleheads in tasting notes, and felt that my own palate (or perhaps my nose) isn’t really up to snuff, so to speak. As a true science nerd I’ve been thinking a lot about smell recently, and it’s something that relates heavily to our perception of the flavor of beer. Flavor is to a huge extent driven by smell: our tongues can taste only 5 flavors: sweet, sour, bitter, salty, Umami (sometimes described as savory). There is also some evidence that suggests a 6th sense of taste for fatty foods, although this is a relatively recent discovery. That means that every other “flavor” we sense is predominantly a smell. Furthermore, the idea of a “taste map” on your tongue, where you can only taste certain flavors on certain parts of your tongue, is pretty clearly a myth. To put this all in context, rumor has it that in the absence of smell, an apple, a potato, and an onion all taste the same [CITATION NEEDED]. 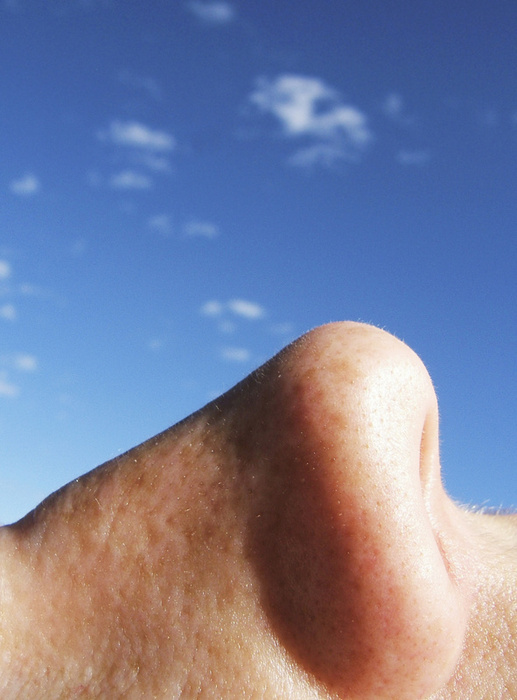 Even more amazing, the theory of olfaction is by far the worst understood of our senses. A Nobel Prize was awarded to two scientists (Richard Axel and Linda Buck) in 2004 for their theory of olfaction: they identified about 1,000 genes – some 3% of our genome (!) – that encode so-called “pattern recognition receptors,” proteins expressed in the nose that bind to odor molecules and allow us to sense smell. It is believed that the pattern of proteins that are activated by a particular scent molecule give rise to our sensing of that particular odor. Of course, with every great theory there is a counter theory, and in this case a scientist named Luca Turin is the main proponent of one: Turin’s Vibration Theory suggests that we sense olfaction by detecting the vibration frequencies of odor molecules. Interestingly, he just published a really provocative new paper – see here for some commentary. If this really sounds fascinating to you, I also can heavily recommend reading The Emperor of Scent, it’s an interesting pop science read that goes through Turin’s story and a lot of the history of scent. W hat does all of this have to do with beer? Well, when I read a tasting note, it’s pretty tough for me to translate some of the descriptive adjectives people use in to an actual flavor (although I do my best!). And that cuts to the heart of it – if someone tells you that an object is red, or that they are playing a G# on a piano, it’s a pretty unambiguous description. With smell/taste though, there’s such a broad range of things we can sense that it becomes subjective, and the same thing can be described as tasting different to different people. In a sense that makes it fun: you can come up with some pretty crazy descriptions of what things smell like. Ultimately though, all that matters is that you convey your thoughts (an inherently subjective thing anyway…). Although I enjoy them, I’m still going to stay away from tasting notes for the time being, and talk about some other stuff that interests me: what makes up the smells of beer. Describing the smell of a beer is a challenging thing – the smell of coffee, occasionally used as an adjunct, is comprised of over 1,000 distinct odor molecules. And that’s a minor component! What makes it more interesting is that our noses can detect incredibly subtle differences in molecules, and that have drastic effects on the scent. 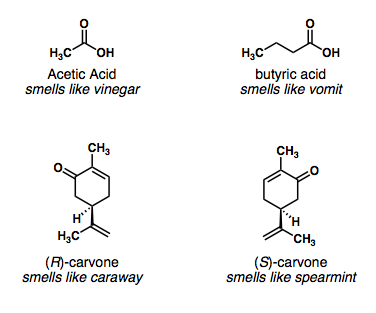 Case in point: acetic acid is the smell of vinegar, while butyric acid (only 2 carbons larger) smells like vomit*. The enantiomers (mirror image forms) of carvone smell like caraway and spearmint. What about beer odors? 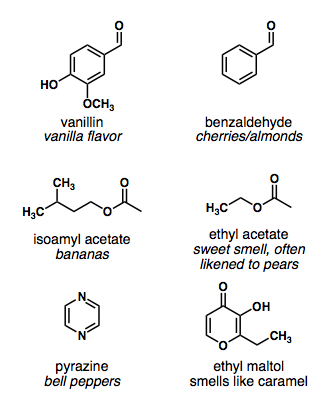 Some flavors do have a single specific molecules associated with them. We’ve talked about biacetyl (a.k.a. diacetyl) and its’ buttery flavor before (see my previous post). But there are others – vanilla, for example, is often due to the presence of vanillin, while benzaldehyde is responsible for both an almond and a cherry flavor (both of these compounds are used as food additives regularly). The banana flavor found in many Belgian beers is isoamyl acetate, while related esters such as ethyl acetate contribute to other fruity flavors. Pyrazines smell like bell peppers, and ethyl maltol is one of the compounds that smells like caramel. So when I hear Brother Barley say “…there are huge, sweet notes of vanilla, molasses and caramel throughout…”, there is a recognition of some very specific smells there. Even though I can’t/wouldn’t necessarily make out all those specific flavors, it does often evoke a particular response. The complex flavors present in beers are really the result of thousands of molecules, and the truth is that different people have different abilities to detect and respond to smells. I might not write the tasting note that way, but it generally does get the job done: a good tasting note makes me want to go try that beer for myself. So keep on drinkin’. *Some of us also link this smell to drinking too much Bud Light. Posted in Aleheads Take On, Beer Culture, Tasting Notes, WTF.Tagged beer chemistry. I was told there would be no chemistry. This post has massive notes of caraway, bell peppers and vinegar. Terrible lacing though.